ISLAMABAD, June 23 (APP): Pakistani Fashion houses and Fashion designing students should learn from French experience in fashion designing to keep themselves updated with modern trends and new innovations taking place in the fast changing fashion industry. 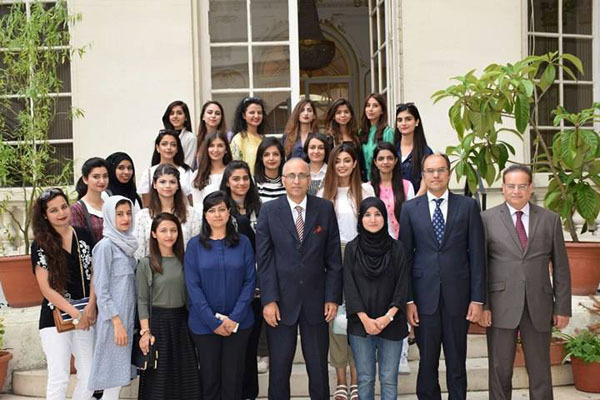 This was stated by the Ambassador of Pakistan to France Moinul Haque while talking to a 20-member group of students of Pakistan Institute of Fashion and Design (PIFD), Lahore which called on him at the Embassy of Pakistan to France,in Paris, yesterday. fashion industry and it has produced world class brands in textile and fashion, which speaks volume of the talent and prowess of Pakistani fashion designers. designer Olivier Lapidus, the Ambassador expressed great satisfaction in seeing the institute becoming a prestigious learning place imparting quality education in multiple disciplines. He told the visiting group that Embassy plans to showcase the impressive thesis work of selected students of PFIP in Paris next year as part of its Public Diplomacy Initiative. Ambassador expressed the hope that such regular training programmes would help Pakistan students in their future studies and career. The interaction with the French designing schools could also help in creating a niche for Pakistan’s Fashion designing industry in France, he added. training and study in Paris. training and orientation visit at the Ecole De La Chamber Syndical De la Couture, Paris, France.